Colonel Fateh Hassoun, a member of the Syrian opposition, confirmed during the Geneva discussions that the delegation is in possession of visual evidence, which confirms that the Syrian regime is closely involved with ISIS. According to Hassoun, the involvement included the handing over Tadmur twice over to ISIS. Colonel Hasooun further stated that “the file will be handed over to the United Nations”. Colonel Hassoun had previously stated that the attack on Homs was executed by government forces, and that the opposition owns evidence that proves that there is a relationship between the regime and ISIS, and their coordination with one another. Moreover, Naser al-hariri, member of the Syrian opposition delegation, accused the governments’ delegation of trying to sabotage the negotiations, adding that the delegation consists of at least five people from the two groups, Cairo and Moscow. Furthermore, the regime’s delegate had not spoken about the airstrikes which were carried out on civilian communities, he stressed. Al-Hariri stated that “our position is honest and clear in condemning all terrorism and terrorist attacks, we also condemn ISIS and everyone who is related to unpatriotic and un-Syrian agendas”. Al-hariri’s statement came as a direct response to Al-jaafari claim to issue a stance that condemns the suicide bombing that struck the city of Homs on Saturday that left forty-two dead. 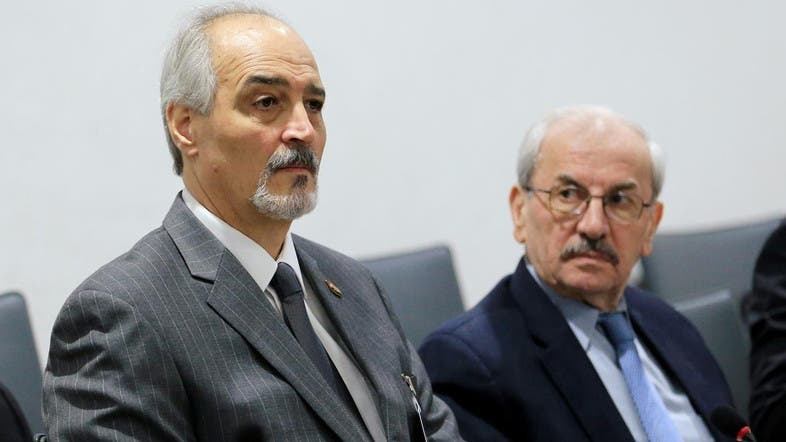 Earlier that day, during the peace convention in Geneva, the Syrian regime's representative Bashar al-Jaafari demanded that they condemn the attacks on the security forces in Homs, warning that if they choose not do so they would be considered terrorist as well.